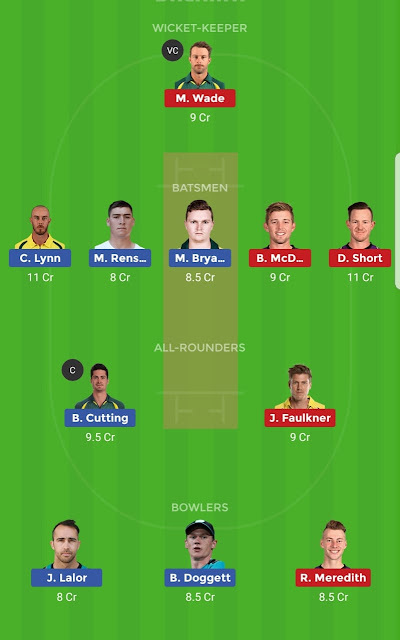 BRH vs HBH, 44th Match, Big Bash League 2018-19. Unchanged 13-men squad has been declared for the match by Brisbane Heat. Hobart Hurricanes also declared 13-men squad for the match with one change. Jarrod Freeman replaces now-retired Johan Botha in the squad and is likely to replace him in the playing XI. Matthew Wade (c), Jofra Archer, George Bailey, Alex Doolan, James Faulkner, Ben McDermott, Riley Meredith, Simon Milenko, David Moody, Clive Rose, D’Arcy Short, Caleb Jewell, Jarrod Freeman. Max Bryant, Brendon McCullum, Chris Lynn (c), Matt Renshaw, James Peirson (wk), Alex Ross/Jack Prestwidge, Ben Cutting, B Doggett, Josh Lalor, Mitchell Swepson, Mujeeb Ur Rahman. Matthew Wade (c and wk), D’Arcy Short, Caleb Jewell/Alex Doolan, Ben McDermott, George Bailey, Simon Milenko, James Faulkner, Jarrod Freeman/D Moody, Jofra Archer, Clive Rose, Riley Meredith. Other C & VC Options: D. Short, J Faulkner, C Lynn. *Watch Video for info on each player.